Just a couple days ago, the Etsy app for the iPhone hit a major milestone, in that it was the beneficiary of fully one million downloads. This is actually pretty big news for several reasons, and not only those that are self-evident. But you might well be wondering how the heavily-downloaded Etsy app might give your small business that shot in the arm that it may be needing, and there are several good answers to that one. The Etsy app itself is, of course, worthwhile for more than a few small businesses, especially those that deal in handicrafts, handicraft supply, or comparable retail ventures. And while this is, admittedly, something of a niche market in terms of its value, it’s not just going to be valuable in terms of what you can sell to other users, but it will also give you access to those selling things on Etsy as well. This gives you access to a variety of different hand-crafted goods that are in turn valuable for decoration or stock in a store. And while the benefits may seem somewhat limited, it’s the “milestone” part of things that opens up the news even farther. See, the Etsy app recently got its one millionth download. And that by itself holds some meaning, but it’s the implications that are even more telling. While the Etsy app has just recently taken that one millionth download, it did so in just under four months. 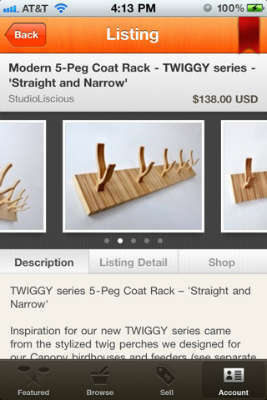 And the release of the app has driven growth to the main Etsy site by between 25 and 60 percent per month. Even better, it sees an average of 30 pageviews per visit. 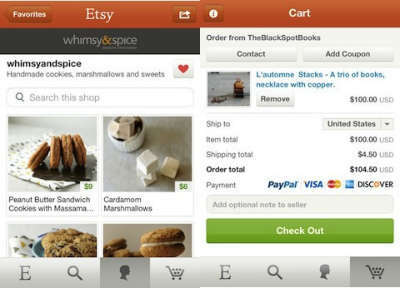 And just to top it all off, the Etsy app is only available on the iPhone, with Etsy looking for an Android developer to take the app to Apple’s chief rival. So not only is the Etsy app likely useful for several different varieties of small business just by itself, it also becomes useful as a model for other small businesses wanting to drive traffic to their websites and also decrease their bounce rates. The combination of all these factors together should be making at least some suggestion to several different classes of business. Whether you’re needing to drive traffic, find a new supplier, or find a new customer–or all of the above, which most every business out there is trying to do in one fashion or another–then the Etsy app will either be useful by itself or merely as an example. Naturally, you’re going to need support to give your current office staff the necessary impact to take care of all those extra customers, and a proper cloud-based telephony system–with features like mobile voicemail and toll-free numbers–is a great start toward giving your office the kind of high-caliber customer service it will need against the extra customers an Etsy-style approach may bring.